Most business presentations are either informative – trying to inform the audience of some information – or persuasive – trying to persuade the audience to take some action. Decide what the audience should know or do at the end of the presentation. This article explains why deciding on a goal is difficult and the two criteria you should use when determining the goal of your presentation. Once you have a goal, you need to determine where the audience is right now and have a plan to move them from where they are at the start of your presentation to where you want them to be at the end of the presentation (like a GPS). This will include analysis of the knowledge level and bias of the audience as well as the level of credibility you have with them. Write an outline on paper or use sticky notes so you can move ideas around. By creating an outline first, you ensure that the content of your presentation is solid before you concern yourself with the visual elements. Here are links to some articles that deal with common types of presentations: Status Update, Presenting a Recommendation, and a Sales presentation. When you are designing your slide look, pick colors that have high contrast so that the text and graphics can be easily seen when shown. Popular color choices include dark backgrounds such as navy blue or dark purple with a light text color such as white or yellow. This makes the text float on top of the background. Check the contrast of your colors with the online Color Contrast Calculator. 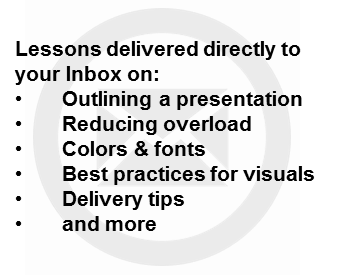 Instead of full sentences, use bullet points to deliver the key ideas on your slides. When using bullet points, make sure not to put too much information on a slide. The 6 by 6 guideline is a good one to keep in mind – on average, each bullet should have no more than 6 words and each slide should have no more than 6 bullet points. This article explains a method for reducing the number of words on your slides. When using bullet points, build them one by one on the slide using the simple Appear animation effect. This way, you can speak to each point individually and the audience will know which idea you are expanding upon. This article explains how proper use of builds helps focus the audience. So you don't have to stand beside your computer to advance each build on the slide, use this remote, the one I have relied on for over a decade. While moving text or graphics around the slide may look like fun, it is very distracting to the audience. Avoid the animation effects where movement is outside the boundaries of the text or graphic. The preferred build effect is the Appear effect where the text just appears in the correct spot on the slide. When possible, look for ways to use a visual, such as a graph, diagram or photograph, to illustrate the point you are making instead of slide after slide of text. Audiences respond better to visuals that get them thinking. I've developed a method for creating persuasive visuals in my book Select Effective Visuals. If you create financial presentations, read this page on presenting financial information effectively. Charts – graphs and tables – can be a great way to present information if they are used properly. When selecting the type of chart, consider whether the data you are trying to show is time sequenced or not and how many data sets you will need to show. For complex ideas, splitting a graph up into smaller amounts of data tied together in an overall graph may be the best way to go. Do you use Excel data in PowerPoint? If so, check out this page on presenting financial information effectively. The best way to be comfortable when delivering your presentation is to actually feel prepared! There is no substitute for practice. All of the good speakers you have ever seen have practiced the art of presenting many times. Practice with your computer and projection equipment if possible to get a feel for it. Practice everything you plan to say, but do not memorize it because a memorized speech sounds "canned" and not like a conversation, the way a good presentation does. When you have carefully crafted your presentation, you want it to look good when projected to the audience. The best connection is achieved when using a digital connection to the projector or screen if it is available. How you connect will depend on what ports your laptop has. Here are the most common options and the equipment I recommend using in each case.